Morphological features of oncosis are characterized by cell and ­organelle swelling and disruption; nucleus is initially preserved and later undergoes karyolysis and caspase-independent DNA fragmentation. The mitochondrial generation of ATP requires the presence of an electrochemical gradient; a reduction in mitochondrial membrane potential frequently precedes the morphological changes seen in oncotic cells. 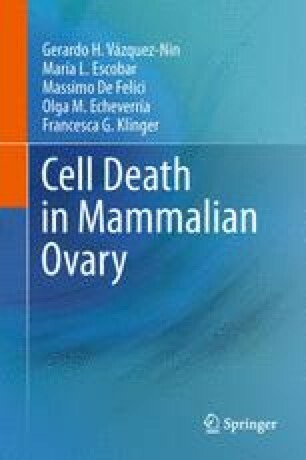 Oncotic cell death is characterized by early plasma membrane rupture and disruption of organelles including mitochondria. The plasma membrane breakdown allows the outflow of cell components, which affects near or distant organs.